A friend ask me the other day if there is produce out in the supermarkets that are GMO’s. I did some research and I found out that those tags we see on the fruits and vegetables in the produce section of your grocery store actually give us more information than the price. The tags are called PLU numbers-PLU stands for ‘Price Look Up’. So I went to all the grocery stores here in Santa Fe and did some detective work! I snooped around the produce section with my iphone taking pictures of the tags on the produce looking for GMO produce. Luckily no one from the stores asked me what the hell I was doing! The good news is that I didn’t find any GMO produce (fruits/veggies) here in Santa Fe in the supermarkets. Now that doesn’t mean there aren’t any GMO foods in the grocery store (I’ll talk about that in a later post), just not any fresh produce (veggies/fruits) that are on the shelves right now. Notice I said right now because there are a few items in the produce section that could show up as GMOs in the future—namely corn and some papayas. I only saw them now as conventionally grown. So here is the info you’ll need to tell if your fruit or veggie is a GMO. All the stores but Trader Joes use similar PLU tags on their produce. TJ’s has their own tagging system so this info won’t apply to them. 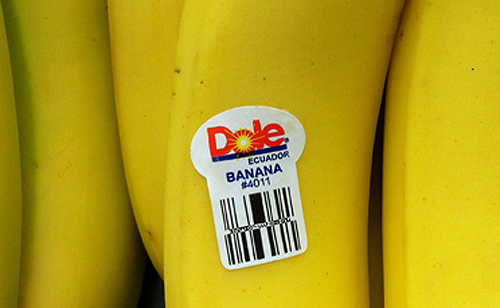 If your tag is a 4-digit number, then it is CONVENTIONALLY GROWN which means the grower could use chemical pesticides and fertilizers on it but it is not a GMO so the orange at the top of the post and the banana above are examples of conventionally grown produce. 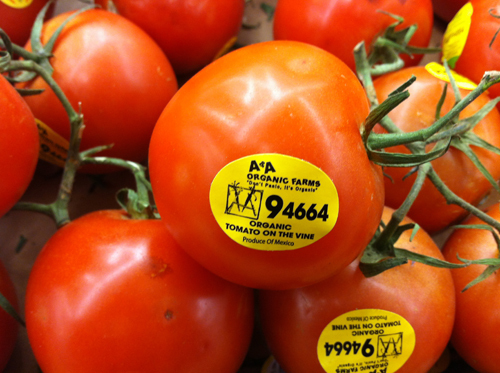 If your tag is a 5-digit number, and it starts with a 9, then it is ORGANICALLY GROWN and if it is organically grown than it is not a GMO. In fact ALL organic foods are not GMO’s. 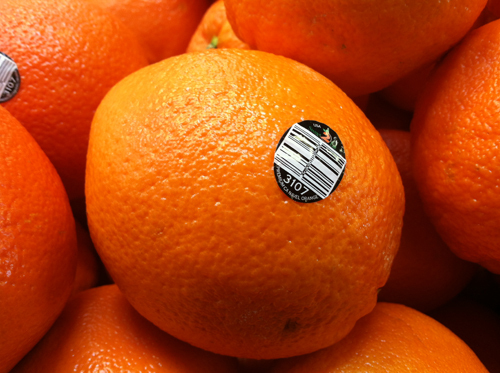 Now if your tag is a 5-digit number, and it starts with an 8, then it is a GMO. Like I said above, I couldn’t find any produce in Santa Fe with a 5 digit number starting with an 8 to take a picture of. Well, that’s a relief! If it’s 8, than it’s not great. If it’s 9, then you’ll be fine! I am not very political but as an organic gardener and consumer, I feel this is important. I just received an email from an organization, Just Label It asking me to sign a petition being sent to the FDA to make food corps label their food IF it has GMOs in them. We are not just talking about labeling the fruits and vegetables we buy in the store (fruits and vegetables are non GMO in the US right now) but to label ALL products that have GMO products in them. If you are interested in signing it, go here. I did. 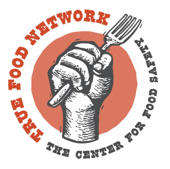 There is also a group, TRUE FOOD NETWORK, that has a GMO shoppers guide that you can download on your computer or get a free phone app to use when you are in the grocery store. I was amazed at what foods and which companies do and don’t have GMO products in them. I’m only promoting this because 1. it’s interesting and 2. we should want to know. Genetically engineered foods are required to be labeled in 15 European Union nations, Russia, Japan, China, Australia, New Zealand, and many other countries around the world. I think we should also have the right to know if our foods have been genetically engineered. I’m not talking about making a judgement about whether it is good or bad, but just label it and let us decide for ourselves. After all if I wanted to know if a product has artificial sugar in it all I’d have to do would be to look at the label. I want the same done for any GMO food products sold here in the US. When asked why Europe has been so successful at generally keeping out GMO foods, it has been said that the Europeans are closer to their food sources. They don’t have the big grocery stores which tend to remove the consumer from the process. They go shopping at the local markets in the streets to get their foods and don’t use as many processed foods as we do and as such are much closer in knowing where it comes from. Now the number one way to go around this is buy everything ORGANIC but not everyone CAN (too expensive) or will so I appreciate True Food Network getting the information together to educate us. Of course what do you expect from me- an ORGANIC gardener? P.S. 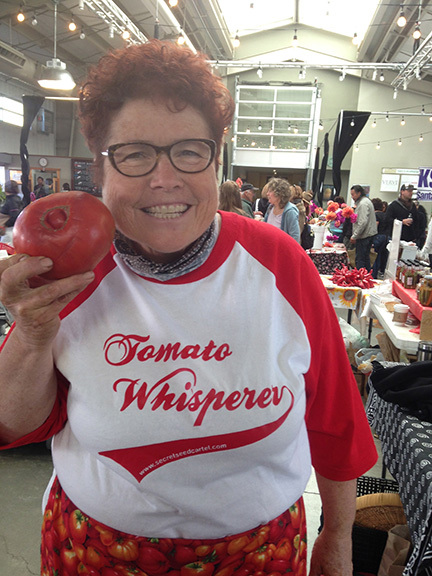 Remember that Minnesota ruling I wrote about where I mentioned an organic California farm also won a ruling against its non organic neighboring farms for contamination of its organic crops? Well, the organic farm is Del Cabo-you know, the one that sells those small cherry tomatoes in Trader Joes and other stores. Now it becomes more personal. I see the Del Cabo brand everywhere in the grocery stores. 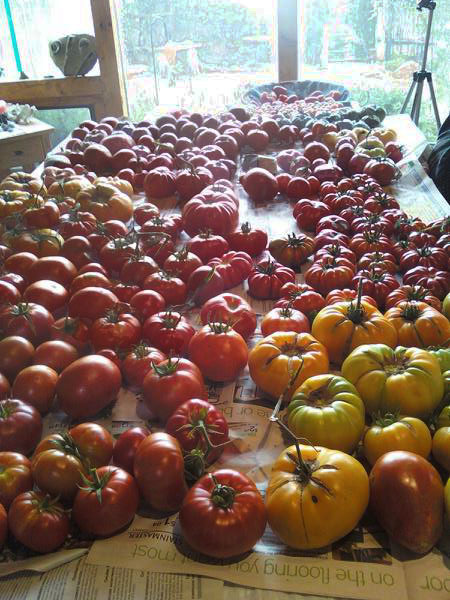 So the next time I see the organic variety of Del Cabo tomatoes in the store (they also have non-organic) I will be reminded of the fight some of the big organic farmers (as well as the little organic farmer) are going through to give us organic produce. It all becomes more personal when you know what’s going on.